Solarseptum has joined the roster with elysian chronicles! @OttoGruenwald I think I found a good challenger for Lilly! The Alpha Alpaca! Here's his bio, tell me what you think! Backstory: Al Pacasso (Real Name: Ar-Pakso) is a member of a race of powerful alien alpacas known as the Argonians that live on the planet of Argon. Shortly after he was born, Al was inducted into a super soldier program that enhanced his already naturally strong Argonian powers. Upon becoming of age, Al joined the Argonian Space Police force known as the “Alpaca Apex”. There, he become well known and feared throughout the galaxy for his great strength and sense of justice as the leader of the Alpaca Apex. Eventually, in a bid to finally take him out of the equation for foiling their plans, a group of space criminals set up a trap for him by placing a fake distress call on a far-off planet called Earth. Upon arriving on Earth, Al was ambushed by the criminals, who damaged the flight capabilities on his suit, damaged the technology he brought with him, and left him stranded on the planet. Although unable to return home, Al discovered that his already strong powers were further enhanced by the lighter gravity and thicker atmosphere of Earth. Upon further exploration of the ruins he crashed in, he discovered an ancient Peruvian temple belong to the goddess of Alpacas, Pachamama, and was chosen as her Champion. There, he used what remaining Argonian technology he had to upgrade the temple into a secret fortress for himself. Upon moving to the city of Norte Chico, Al settled down to start a new life on Earth as its defender while also working on accelerating Earth’s space travel technology in hopes to get home someday. As Al, he works in a museum documenting artifacts and doing other odd jobs when not out superhero-ing as the Alpha Alpaca. 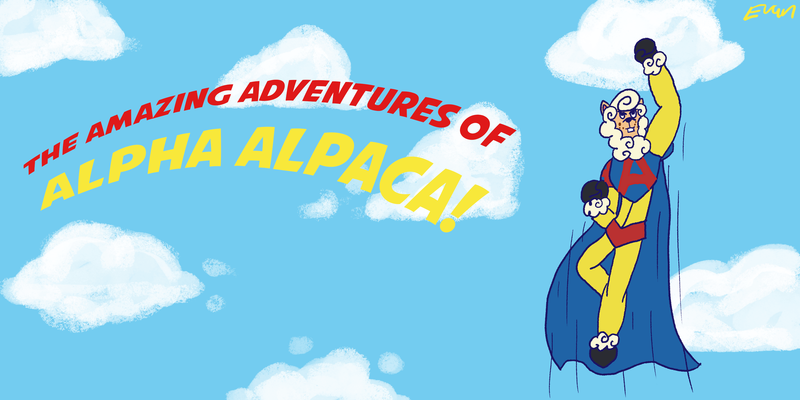 Personality: Al is a very kind and compassionate alpaca with a strong sense of justice and morality. He has a lot of passion and feels very strongly about what he believes is right and wrong, which often gets him into trouble when he charges in blindly without thinking when he feels somebody is being wronged. He’s quite friendly and affable with a good sense of humor and likable charm. As Al, he’s relatively mild-mannered and quiet, almost to the point of being a bit of a pushover. The exact opposite is true when he becomes the Alpha Alpaca, in which he becomes much more boisterous, energetic, and strong-willed. He loves to showboat and toy with opponents he considers weaker when he’s a superhero, leading him to often underestimate his opponents and get into trouble. He can also be quite prideful and hungry for attention and will show off for civilians if he sees an opportunity. However, he will often try to keep his ego in check when he feels that a situation is serious enough and will become very serious and determined if he feels it is necessary to. Finally, despite his super intelligence, he isn’t the best tactician and often doesn’t think things through very well or consider the consequences of his actions as a superhero, often times leading him to be very overzealous with his powers, causing quite a bit of collateral damage in the process. Thanks to a combination of his Argonian physiology and the lighter gravity of Earth, Al can lift or press objects many more times than should be possible. With this immense strength, Al can punch with multiple tons of force and can create tremors of varying strength by stomping the ground with his hooves. He can also produce incredibly powerful shockwaves by clapping his hands together. The true limits of his strength are currently unknown at the moment. Al can move at speeds far faster than what would normally possible. This speed grants him enhanced reflexes and agility. He can also fly at speeds faster than he can run as well and could reach faster than light travel with the assistance of his cape before it was damaged. Even without his speed enhancing technology, he can still reach speeds many times faster than the speed of sound on both foot and in the air. He also has excellent climbing abilities and can scale most any surface quickly and easily. With this speed, Alpha Alpaca can also create tornados and vortexes of powerful wind by either flying around in circles, spinning around, or rotating his limbs at high speed. Al’s five senses are greatly enhanced, allowing him to see, hear, smell, taste, feel, and perceive things in much greater detail than a normal person would. His sight is greatly enhanced, allowing him to see telescopically and microscopically along with being able to see through most materials with his X-Ray vision. He can also fire beams of intense heat or freezing energy from his eyes or focus his electrical powers through them as bolts of lightning. An Argonian like Al’s senses are so precise, that they can manifest a “sixth sense” of sorts that allows them to see and track energy sources up to and including ghosts and other supernatural phenomena. This grants Argonians excellent tracking sense, allowing them to follow nearly anything across great distances up to a galactic scale. Due to the thinner atmosphere of planet Argon, Al has a much bigger lungs than other beings, allowing him to hold much more air than normal. This means that he can hold his breath for extended periods of time, withstand great amounts of pressure, and survive in places that are normally inhospitable like the depths of space and deep underwater. This also means that he can then exhale said air with great force and pressure, creating winds often times far stronger than a hurricane. Said gusts can be focused into a pinpoint blast, or a massive swath that can destroy everything within the cone of gales. He can also reverse the winds by inhaling with similar force, allowing him to drag objects towards him or dispose of poisonous gases by containing them inside his lungs. He can also super-cool his breath to create blizzards or freeze enemies when he exhales (Atomic Freeze Breath), or super-heat his breath to melt ice or dry objects rapidly by blowing (Atomic Heat Breath). Thanks to his enhanced breath and strong lungs, Al can also amplify his voice dramatically to either perform a loud yell or create destructive shockwaves with just his voice and anything in between. Another skill granted to him by his enhanced breath is the ability to spit his saliva with pinpoint accuracy and destructive force. Argonian saliva has a wide variety of odd properties such as being acidic or highly conductive to electricity among other traits. It is unknown exactly how his saliva works when it comes to selecting effects. Using combination of his already existing powers along with some other tricks, Al can use his powers to control and change the weather to a degree. He namely accomplishes this with a combination of his super speed, static electricity powers, and atomic hurricane breath. His power suit also allows him slightly more precise control over the weather by allowing him to raise and lower the temperature of the area along with redirecting the winds and clouds. With this, he can start and stop storms like rain showers or snowstorms among other weather phenomena as well as increase or decrease the intensity of them or completely dispel the weather altogether. The main limit of this ability is its lack of precision control over the weather and lack of range due to being only limited to Al’s vicinity. Thanks to the Argonian’s naturally thick wool, Al can collect large amounts of static buildup on his body and release everything from powerful electrical surges to relatively harmless shocks. He normally can’t direct, control, or contain the stored electricity very well. Thankfully, his super suit is specially designed to contain and amplify the built-up static so that he can focus it into precisely controlled lightning bolts from his hooves as projectiles. He can also use his static bursts to create localized small scale lightning storms as well, although some times not intentionally. He can also use his wool to absorb electrical energy from his surroundings to power himself up and unleash stronger blasts of energy. Another side effect of his thick wool is that he has very high durability. His wool allows him absorb impact shocks and energy attacks to nullify them. This wool also grants him an immunity to extremely low temperatures and ice attacks. Although he still can be frozen by strong enough ice attacks (Like those produced by Boreas Starwind). Al has increased intelligence, martial arts skills, the ability to throw his voice using clumps of his wool, and create speed clones among many other powers unknown at the time. A special powered up form for Al that can be accessed by channeling large amounts of natural energy. This form causes his suit to change from it’s normal red, yellow, and blue for a white, navy, and orange palette. His fur also becomes a brilliant white from the energy build up and his skin becomes a dark orange-red. In this form, his natural Argonian powers are amplified to a very high degree and his body constantly radiates intense heat and energy at all times when in this form, which helps reduce his natural weakness to fire and radiation. The sheer amount of heat and electricity he radiates causes him to be surrounded by lightning storms and a field of swirling winds as long as he’s in this form, granting him an extra layer of protection. In addition to the power boost, Al also gains control over the elements and the ability to unleash electro-photonic energy blasts from his hands, eyes, and mouth. The main weakness of this form is that it burns through the stored energy very quickly, forcing Al back into his base form and causing him to lose his powers for at least 24 hours afterwards. A secondary super form accessed by channeling the powers of Pachamama through her magic statue into himself. This form causes him to increase considerably in size and muscle mass although it does not change his color like his Omega form. In this form, his strength and powers are dramatically increased and he constantly radiates massive amounts of pure energy from his form far beyond that of his Omega form, so much that he creates massive lightning-infused hurricanes just by existing. His power becomes so great that his footsteps could cause destructive earthquakes and tremors and he could make massively destructive hurricanes with a mere breath. Al has to work extremely hard to control this form when using it as to not cause more damage then is necessary with his powers as he could not just destroy the world, but also himself from the overload. His personality also changes to become more violent, angry, and emotional when in this form with a risk of losing control and becoming a mindless berserker. This form also burns through energy very quickly and leaves Al very burnt out afterwards, robbing him of his powers for a much longer time than the burn out that results from his Omega form. A special signature move used and invented by Al in which he rapidly spins himself around before punching the opponent with full force. The spinning not only has him gather momentum for increased impact, but also gathers up great amounts of wind in his fists to further enhance his punch by unleashing a powerful gust upon impact to send the target flying. He can also preform an enhanced version of this where he spins around at very high speeds until he becomes a small tornado before ramming the target at high speeds while still spinning, dragging the target and whatever surrounded the target into his cyclonic slipstream. Due to his thick wool, Al (and other Agronians) are very susceptible to extreme fire and certain wavelengths of radiation, although he does have some form of resistance to extreme heat (although not as much as his resistance to ice). Upon exposure to flames or said radiation, his wool can catch fire and his powers go on the fritz, possible leading to death if he doesn’t take of the flames soon. Thankfully, his suit is equipped with environmental manipulators to assist in safely dispelling his weaknesses. Another weakness he has is that if he uses certain powers too much and over exerts himself, then he will lose access to that ability for a few hours. For Example: If he uses his hurricane breath for too long and too much, then he would not be able to use said hurricane breath even though he can use his other powers in the time being as long as he doesn’t overtax those as well. The duration of how long he can’t use those powers depends on how much he exerted himself. As a result of the super soldier project he went under as a child, he aged slightly faster than normal. Resulting in him still having a somewhat childish mindset, is somewhat emotional, and is prone to overreacting in certain situations. Also, despite his intelligence, he isn’t the best tactician and often doesn’t think through his actions or plans very well alongside being overzealous with his powers resulting in him causing more collateral damage then he intends to. He’s also somewhat selfish and prideful, leading him to underestimate his opponents and the value of his hero work in regards to his goal of getting back home alongside other, smaller goals he has (Like getting back to a picnic with his girlfriend). Every member of the Alpaca Apex is given a standard issue power suit that at least doubles their natural powers and strength. They also are very durable and naturally enhance the shock absorption abilities of an Argonian by being made of a special fabric that was specifically designed to distribute impact shocks. They also come equipped with a flight harness and cape that allows the wearer to achieve faster than light travel, allowing the Alpaca Apex to be effective galactic patrollers. Higher ranked suits also come equipped with unique abilities and designs for each individual user. Each suit can also absorb energy to power itself and assist the Argonian’s natural static buildup abilities. The suits can also produce their own personal atmosphere for safer space travels as well as allowing easier access to their super abilities. Al wears a Leader Class Super Suit, one of the highest ranked super suits available. The suit has a special environmental manipulator in it that grants Al the limited ability to control the weather within his vicinity. Unfortunately, its flight harness was damaged in the ambush that stranded Al on Earth, disabling its FTL capabilities but keeping the strength augmentations. He can also use his cape to create small tornados and powerful gusts of wind by swishing it as well as using it as a shield to deflect attacks. A magical jade statue of an Alpaca that Al discovered when he first crash landed on Earth. In it was sealed the legendary goddess of Alpacas herself, Pachamama, until Al freed her from the statue. Due to Pachamama’s time sealed in it, the statue became a generator of large amounts of pure magical nature-elemental energy that Al (and others) can draw power from for a brief power boost that can grant the user various unique abilities. However, if one draws too much power from it, they run the risk of becoming the fated and incredibly dangerous “Alpaca-lypse Bringer” and draining the artifact of its power, forcing it into a very lengthy recharge period. As thanks for freeing her, the statue granted Al not just a boost to his already existing powers, but also a few new tricks that Al has yet to discover and master as Pachamama’s Chosen Champion. He could work! I'm a little hesitant on bringing creators back so soon though. I don't want to repeat creators until like after fight 10 if it can be helped. I love Alpha Alpaca though, he's definitely someone that we're going to have to use for a fight! Also, another interesting fight could be a Flare vs Flare rematch that's a doubles match with my Flare having his second in command Takeru Grey help and @chita's Flare having Shade with her. I love stuff like this! Unfortunately, my series is all about my main character slowly developing new abilities and learning to use new weapons, so at this point (less than 10 pages in) he's not really fit to fight anyone, but if this thing is still going in a few months I'd be happy to throw a character or two in here. I'll be keeping an eye on how this develops though. We got lots of characters that are just starting out on their journeys. But if you want you can wait for your character's story to progress before you have him participate. Would you like to add an arena to the arena list in the meantime? We could always use more! Flare vs Flare is finished! @aqua03 @Chita if you guys like you can still submit art of your characters fighting for the gallery. So battle 1 is done! What did you guys think? Be sure to shower everyone involved with views and subs! If we ever get around to needing combatants who are non-powered, I have a few who appear in my Alien Fiction series. Because this series is satire comedy, their skill levels as fighters vary from somewhat competent to entirely incompetent. Off the top of my head, they are Pirate, Ninja, King of the World, Hobo, and finally our protagonist, Firefighter (a.k.a. Candide). Most of them are idiots. Hobo got an upgrade during his most recent appearance, but it has not yet been revealed what he can do as Hyper-Hobo. In the spin-off book, I have a small number of trans-human characters who are a little more serious and capable, but that is the subject of another post another time. Before anyone asks, the aliens themselves who abduct these humans and make them fight gathered these characters because the aliens don't actually understand humans that well. (And those aliens are severely over-powered and thus mostly hands-off types; we're talking Stardust-level omega-powers.) All of these characters are novel characters, not from webcomics. So, onward to battle 2: Jr vs Jodi! A popular hangout spot in Flavorcity where artists gather and decorate the walls with moving graffiti. The architecture of the plaza is like the architecture of the surrounding city. It's a fusion of wild jungle and busy metropolis with purple trunked and orange leafed trees crowning high rises, moss growing up the side of buildings, and vines connecting skyscrapers to smaller buildings. @BobbyjoeXforgotensb and @Sanz is this arena alright for you guys? Sure, Im ok with it. We could have a non powered fight soon. I was thinking about asking if we could use Sanori from https://tapas.io/series/Aiiro-No-Kunoichi. She's a young ninja heroine in a modern setting. You mentioned you have a ninja character? Yes, these are characters that we should drag out as needed. It looks like we have a number of powered and-or supernatural characters who get their turns first. She is available, and her name is Ninja. P.S. In an upcoming chapter, I am planning to give Ninja an upgrade also. Minor spoiler: her alien master will fuse her with another of his abductees, Mime. The alien's plan is to create the double their skills and create the ultimate silent assassin, the Mimeja. She will actually be a less proficient warrior after the fusion because a Mimeja is a terrible idea, but she will be a much more interesting character by then. Hey guys thanks for letting me join! This seems like a really cool project so I'm really excited! a place could be one of the layers of hell prehaps. unfortunately i don't have it drawn out yet but maybe the layer of wrath would be good place to fight. also redburn is majorly op for what he is he doesn't enjoy fighting or violence but he would if say.... one of his girls was in danger. i can give his rundown if you want to use too. let me know. if you want to get cheeky you can use the city of godtown i do have that rendered somewhere i can show you, and that would make for epic fight scenes being crashed into buildings and cars and civilians. also sorry i was mia email said i was tagged but not that there was a response. Is it too late to be involved with this? That was amazing, thank you so much!! To be honest I never thought that my girl would win XD. And about the art thing, I have some scenes in my mind that would look nice as a drawing, I'll get them done when I have some free time cause right now I'm kinda busy with many things, but I'm doing them!! Also if you need help with any of the following matchs PM me. I won't wrote them cause English isn't my first language so I'm not comfortable enough with it to write a complex fight scene... But if you need anything else give me a call!